Simple to use, 120 volts, plugs in anywhere. Durable, versatile, energy efficient, and productive. Energy efficient quartz heaters. 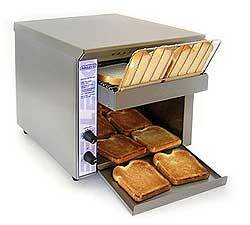 Up to 350 slices or bun halves per hour. Cool touch exterior. So safe can be used for self serve operation. Basically you can toast anything that will fit in the 1 1/2 inch opening. Bread, buns, rolls, bagels, pita bread, texas toast, english muffins, even waffles. Variable conveyor speed control. Stainless steel construction. Quality commercial equipment. Manufactured in the USA.